Culture - discounts in theatres, concerts and museums. Sports - Discounts in gyms. The card is used by 120.000 people per year in 37 countries. In order to obtain one, one of the following criteria has to fit you. You have been an international student in the past. You are currently an international student on exchange. You are an ESN member. A precise overview of all the advantages and the discounts with the ESNcard can be found on its official website, ESNcard.org. With the code on your card, you can register online and use all of the international discounts such as New Yorker, HostelWorld, Brussels Airlines, The Economist, EuRail, InterRail, BlaBlaCar, Education First and many others. 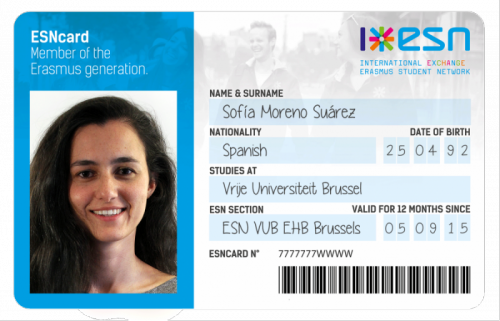 The ESNcard is exclusively sold at your local ESN section. Find them here in order to contact them. The card is valid for 12 months and only valid with a photo and correct personal data. The card is strictly personal and can’t be used by somebody else than the card holder. If you want to become a partner of the ESNcard and contribute to the experience of going on exchange, contact us at board AT esnaustria DOT org.